If you think back to high school science, you may recall that in order to affect the heat transfer process you must slow down conduction, radiation and convection. 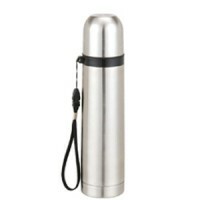 Thermos products do this by using a glass envelope, which is as close to being a perfect vacuum as is possible, and lining one side of it with silver. Both of these together limit heat transference. Thus, the liquid inside, whether hot or cold, remains at its’ temperature for a long time, no matter what the ambient temperature may read. Even though a century has passed, science has not left this idea alone. What if we can do this on a grand scale? In fact, it is being done with high tech windows. One company who has seriously pursued vacuum insulated glass is Michigan based Guardian Industries. They have spent years trying to perfect this concept as it applies to window glass. They are closing in on the marketing of window glass that has a center-of-glass insulating value of R-12 to R-13. These high values are unheard of at the present. Regular glass windows still in use in most homes get values of around R1 or R2. A house with this type of exterior glass would actually be able to save more energy than it uses. How does the “vacuum flask” concept work with huge pieces of glass? Of course, you start with two panes of glass and then separate them with a space of .25mm by creating a vacuum. Using small, nearly invisible “pegs” (for lack of a better word) the two panes remain separated. This alone keeps two of the three heat transfer culprits at bay: conduction and convection. What about radiation? Guardian uses a Clima Guard low e-glass which helps to reduce radiation. This glass has two metallic layers of coating on its low e-glass. Finally, the edging is a non-traditional proprietary sealant as maintaining the vacuum is crucial to this design. Like many of these new developments in their early stages, the challenge is to reduce the manufacturing cost so that consumers can actually buy it. This has been one of the bigger challenges for Guardian. It is worth remembering, however, that purchasing trends seem to show that value, not price, drives sales in energy savings products. Thus, the price may not have to dip too low if the energy saved is significant. Turning homes into energy creators is now more reality than myth. Guardian has already begun distributing prototypes for use in a variety of markets. This in-field testing is vital as it is not known how the glass panes might fare in excessive heat or wild daily temperature fluctuations. Regardless, there is no indication that Guardian is going to give up on this idea any time soon.